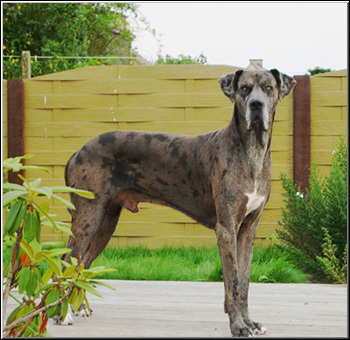 This page is built and maintained by Melody Rainwater as a tribute for other Great Dane owners that have lost their dear friends and companions. Anyone who has lost their four legged family member can feel free to email me and I will be more than happy to share my space for your farewells and remembrances. I am dedicating this web site to my best friends and companions, Littlehorse Vindicator JD "Vinnie", and Littlehorse Indian Raindance "Rain" who wait for me at the Bridge. 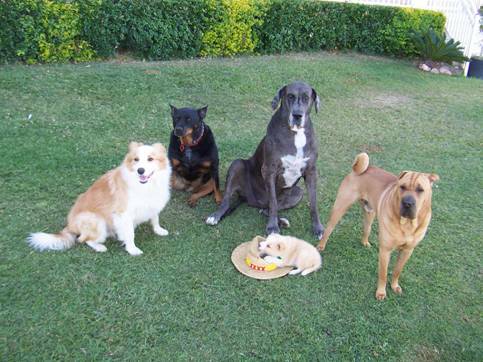 I know they will take care of Littlehorse's Jasper who recently joined them as a young puppy. He was a victim of parvo virus and although his family didn't get to know him for long, they will love him forever. To read my tribute to Vinnie click here. On October 18, 2000 our lovely Rain joined her brother Vinnie at the bridge. I'll miss you my sweet girl. Rain was beloved by "her mom and dad" Johnny & Melody Rainwater, her "brother & sister" Bobby & Sandra McDonald, and her (what she considered her litter mates) AlexSandra & Connor McDonald. And last but not least, her adopted son, Fleetwood, who is still searching for her. Fleetwood went to the Bridge to join Rain November of 2006. We will always miss our floppy old hound. To read "The Rainbow Bridge" Click here. 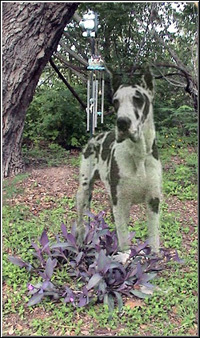 Music title, "Song of the Wolf "
In the future, if any one of you would like to display pictures of your lost Great Dane "dear ones", I'd be more than glad to add their imagines and your farewells to this page. This is where Vinnie sleeps. Under our old oak tree. should I allow the pain and suffering to go on? Your eyes are asking for me to help you. I want to believe there is still hope and that everything will be just fine. If you can not go on, and this has to be. Then I can only say goodbye and live with the sorrow and pain. It will never be easy! Is there a dog heaven? Are you there? Is there a dog heaven? Who do you see there? Do you see our boy Zolan and sweet girl Witse? Can you tell them how big the loss of our sweethearts is? Give them a big hug and take care of each other. 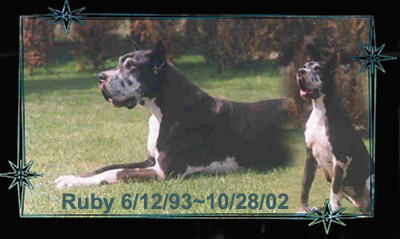 Ruby, Zhessy and sweethearts, we will miss you!!!!! From the moment we saw you, you took a very special place in our hearts. Words fail to tell the world what a great dog you were. 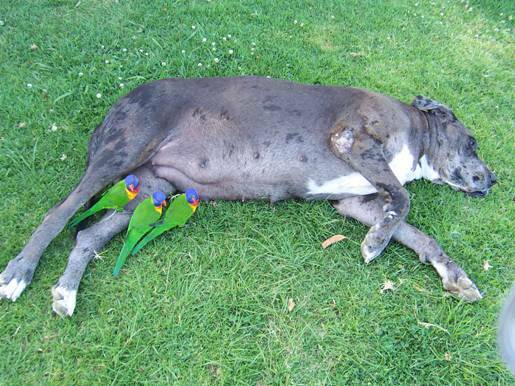 Always...........an example for the Great Danes. Thank you for everything you learned Jaimy and me. Until we meet again my dearest Friend. Thor crossed the bridge on 5/2/08 he was born 2/26/98. He was one of a kind the absolute best and he was loved by everyone that ever met him. His legacy will live on and touch the hearts of many more. He was not a dog or a pet he was our child. Thor remained true to the end he said he wanted to cross the bridge and we wanted him to stay. Letting him go was hard especially for Rock. Rock came to us in mid October 2006 and that's when he met Thor, and on June 2, 2008 he knew that was going to be the last time they would be together and he cried and didn't want to do anything except be with his dad. He was already 10 years old when I rescued him from animal control. His owner had beaten him for having an accident in the house, and he had nipped him in self defense. I was called because the Animal control didn't have the heart to euthanize him when his 10 day quarantine was up, as the owner had demanded. The owner had had a history of abusing him and they were happy to let me take him home. 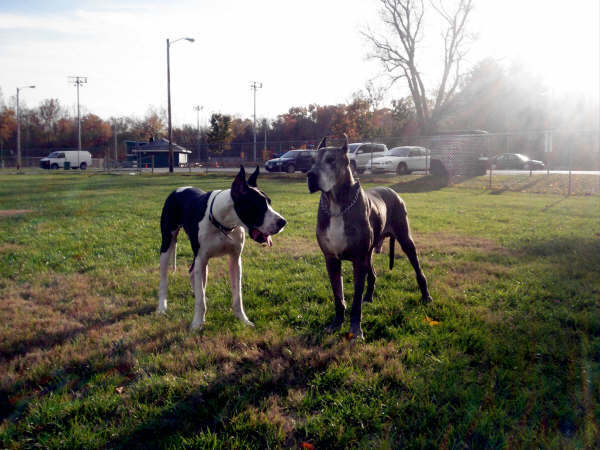 His name was Sampson and I fell instantly in love with this small, gray faced Great Dane boy. I called him affectionately "old man". He was arthritic but spunky as a 2 yr old at times! He fell right in with my 4 Danes and made his place here. He was afraid sometimes and sought me out for comfort. He was my shadow. After 41/2 months, his arthritis became very painful, medicines were no longer working and he was becoming confused. He asked me to help him to the Bridge one morning and I could not refuse this gentle "old man". He was lovingly let go on January 23, surrounded by myself, Midge Kelly (president of our rescue) and both Dr. Nichols and Dr. Rufner, our wonderful rescue vets. 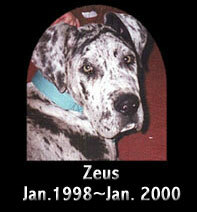 To this day, none of my Great Danes lay on his pillow and they seem to "know" he is still here, in Spirit. For this is where I truly believe that he learned what love was and I pray he went to the Bridge a happy boy. I miss him every day. Great D.A.N.E. 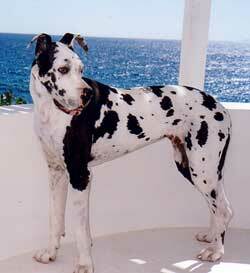 "Great Dane Angel Network Enterprises"
Words cannot describe the sorrow I face at my loss. I've enjoyed his companionship since my ninth birthday. From the days of a four week old puppy to the frailness of his old age, I've never stopped loving him. He was the greatest dog I have ever known. He sure did love people. And everyone loved him too. To those of you facing similar decisions in your life, putting an ill animal to sleep is truly the best gift you could give to them. Randy was old, and he had cancer for a year, and was truly suffering. I held him as his life faded away and his spirit was carried to Heaven. He is in God's hands now. Rest in peace, Boo-Boo. We love you and you will be missed. If you would like to e-mail a message or a tribute, feel free to do so. I will post it on this page. See you on the Rainbow Bridge, Baby. The story for this poor boy is too long to display on this page. I recommend clicking on this link to read it. It is very sad and points out how cruel and heartless some people can be. To read his story, click on link above. 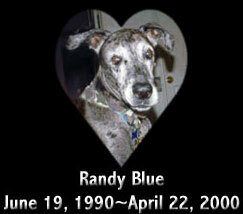 Here is our "puppy" for your Rainbow Bridge page, who we lost this past Sunday. 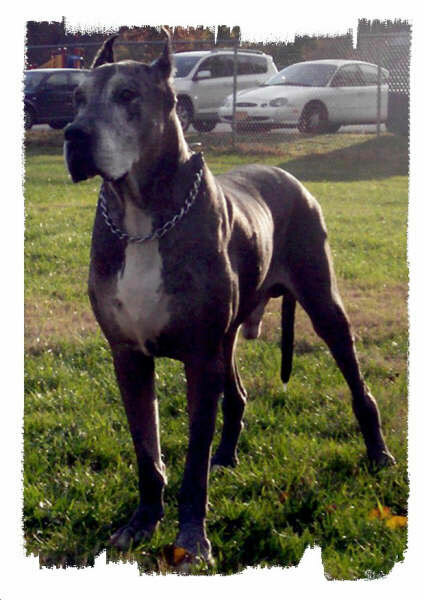 On a sunny Sunday in March, high on a hill,with the sky so blue as to be unbelievable, and the breeze holding every promise of spring and a rebirth, Nikki, our cherished Great Dane, and noble companion, took his leave of this life and those who loved him. Disconsolate with his loss we are thankful nonetheless to have shared his short time here and will hold his splendid and gallant heart, in ours forever. 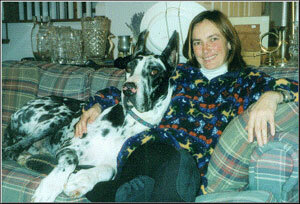 This beautiful merle was the mother of some of the best harlequins in the show ring and her owner misses her terribly. 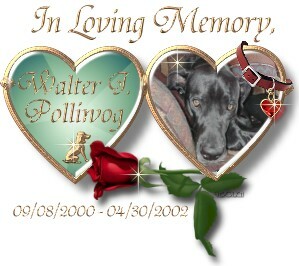 Walter, my sweet Prince, know that you were my best friend and my heart. I will miss you until I join you again on the other side. 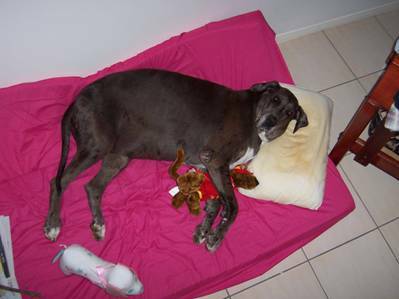 This is the story of Pepsi....my loving blue girl who died at the age of 5. Read the story of Isak. "Kinship with all creatures of the earth, sky and water was a real and active principle. And so close did some of the Lakotas come to their feathered and furred friends that in true brotherhood they spoke a common tongue. the right to man's indebtedness." How do I tell my Python that she�s dying of D.C.M .